Senior citizens enjoy a wide range of interests just like everybody else, however most seniors cannot participate in the same activities that they used to do when they were younger. Many studies have shown that an active lifestyle is an important part of maintaining health as we age. It doesn’t stop at just basic physical exercise either. Staying mentally active is also incredibly important for senior citizens. Below, you’ll find five of the best activities for seniors to do at home. These will boost physical health and mental abilities. Best of all, these are activities for seniors that will be enjoyable for individuals or for a large group. To insure the safety of the activity please note that several of these activities are best done under the guidance of a qualified caregiver. Arts and crafts related activities are enjoyable for people of all ages – not just for the young. 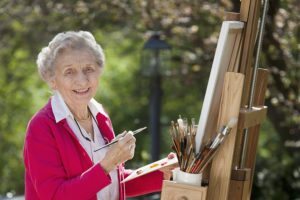 While the projects you do with seniors are certainly different than those you do with kids, something as simple as drawing a still life scene or making an abstract watercolor painting can keep seniors creative and using their minds. Arts and crafts project should be geared toward the senior’s particular interests, so make sure you talk about what they would prefer. Some seniors would prefer to paint while others would rather build a model car. Strength training exercises are something that many people don’t think about in terms of seniors. However, strength training doesn’t have to mean deadlifts and squats – it can mean something as simple as lifting light free weights or using resistance bands. Strength training is one of the best physical activities for seniors because it helps boost metabolism, improve muscle strength and improve balance, which can reduce day-to-day injuries. Light strength training just two times per week should benefit most seniors a great deal. Seniors with physical or cognitive disabilities may not be able to cook full meals on their own. That doesn’t mean they don’t want to be involved in the food preparation process or that they can’t be. Preparing meals with a senior can keep them feeling involved and in control in their lives and there are plenty of activities they can do before a meal. For example, almost any senior can put together a salad with pre-sliced ingredients. Keep cooking activities short for seniors with cognitive impairment and don’t make the tasks too complicated. You’ll want to do most of the cooking, but asking for a little help can go a long way toward keeping seniors involved and interested. Walking is an ideal activity that almost all seniors can do because it can be done at their pace and when it is convenient for them. It can also be done in almost any neighborhood. Going for a short hike on an easy trail is another option for seniors with a little better fitness level. Many nature trails are less than 1/2-mile long and don’t have steep hills or gradients. This activity can be ideal for many seniors and getting outside in the fresh air can be beneficial for everybody. Actively listening to music is a hobby that most people enjoy in life but often forget when they get older. Helping a senior in your life listen to music can be a beneficial activity and one that can be done every single day – even if it’s just for 10 or 15 minutes. When picking music for seniors, choose something from their collection or youth. Asking what type of music they like is also important. Don’t make music listening activities too long. If they can get up and move to the music or keep to the beat while sitting, even better. These 5 activities are just a few of the things that seniors can do at home to boost their physical health and mental abilities. Subscribe to the Custom Caregivers blog to find additional ways for seniors to stay healthy and active. Cindy Greenberg joined Custom Caregivers in March 2017, after working over a decade in a private Dallas-based medical practice as Office Supervisor and Patient Liaison. Cindy now serves as the Director of Compliance and Alternate Administrator for the company. Her passion and enthusiasm for her job matches the high level of attention to detail and client service that she brings to every situation.